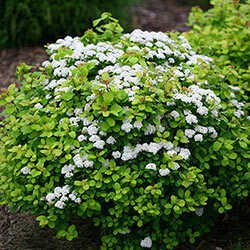 Here's a lovely accent plant for filling out an opening near a walkway or adding density to a corner of the garden–and you can get it right now. Its colorful clusters of blooms attract butterflies in the spring and contrast sharply with the rich green foliage mounding just below. In the fall, the greenery turns various shades of purple, orange and red, mimicking the changing leaf color of trees in the landscape. Deer tend to avoid. 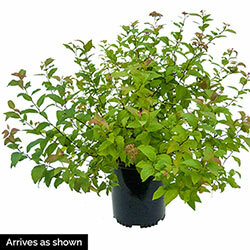 This rounded shrub will arrive growing in a gallon pot, ready for you to add where it's needed.